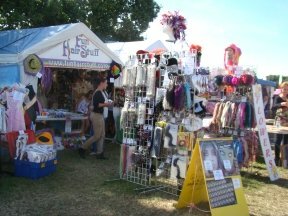 Wondering how to book the Fun Hair Stuff stall for your festival or event? This is where. We can attend large festivals and events lasting at least 2-3 days throughout the UK, and also smaller events, workshops and parties in the East Midlands between September and May. Don't leave it to the last minute to book - we get pretty busy. For large festivals, we have a huge amount of stock. Everything from hair braiding stuff, LED braids, dreadlock wools, bows, feather and bead decorations, hair falls, dreads, removable braids, bead braids, handmade flower garlands, hundreds of hair flowers, UV hair colours, festival make up and body dec, eyelashes, lip tattoos and hundreds of friendship bracelets - and lots, lots more! We can come to parties and smaller events near the East Midlands from September to May (when we aren't busy away at festivals!) Why not give your party the wow factor with hair braids, bead wraps or other funky hair decorations? Or learn how to make friendship bracelets? We also run occasional learn to hair braid workshops. If you are not too far away from Nottingham and can get a few friends together to learn, let us know. If you want dreads installed or a few braids done, you can come to our premises in Arnold, Nottingham by appointment, but we often can't fit much in during festival season!